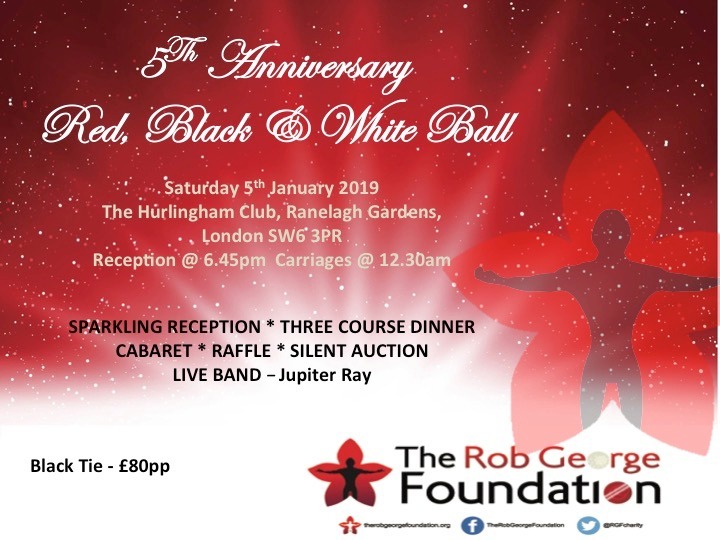 It’s hard to believe that on the 5th January 2019 we will be celebrating the RGF’s 5th birthday – please come and join us if you can. The price of a ticket is unchanged at £80pp, for which you will share with us in a party the like of which you rarely experience. Yes it’s a posh night out -the theme this year is Red, Black and White (the RGF colours), evening dresses and dinner jackets being the order of the day, but it’s also a gathering of the RGF family. Everyone is welcome, bring your friends, and let’s get them hooked on everything the Rob George Foundation is trying to achieve and celebrate too! Help us make this Ball truly spectacular!! Tickets can be ordered from the RGF shop. If it’s too early to actually pay for your ticket, please would you email us your intention to attend. lorraine@therobgeorgefoundation.co.uk. Money by early December please, but this will save your seat and save our stress!! Please view the catalogue for our Silent Auction, which runs up to our Fifth Anniversary Ball on 5th January. We have some fabulous lots; please take a look and bid generously.